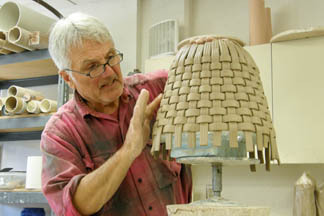 Jim and Shirl Parmentier have been creating pottery together for 35 years. Working as a team, the two artists pass work back and forth, as well as creating pieces individually. They have found that the open studio space in which they work invites the flow of creativity. The artists' first stylistic concern is with form and proportion, which they create to fit the flow of the vessel. With form intact, they add surface alterations to conform to the shape. The ash glaze will flow into these carvings and crevasses. 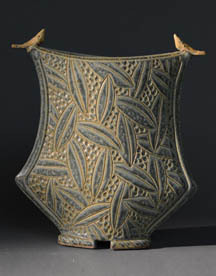 With this continuity of form, alteration, carving and fluid glazes, the vessel is complete.